Friends today we are talking to bloggers who are new to the blogging area, who do not know how to blogging posts. Friends, today we will talk about how we would promote our blog 3 simple methods. Dear Readers, When a new blogger creates his blog, he does not have any knowledge of posting at that time, in which he keeps posting on the post, but due to lack of proper promotion of the blog, more readers on his blog Can not reach it, and as a result, he is dissatisfied with blogging. Remember that the blog is created in Google's free service blogger, anyone can make it, but after starting the blog it is the most difficult task to run it and make the right promotion. The promotion of the blog has to be done exactly as a salesman spreads its propaganda to sell his product. With the advent of social media in today's era, the promotion of blogs has become much easier. Just need to be active on social media, the blog gets hit soon. At first glance, a new blogger should first look at its good bad aspects, get information about blogging, start blogs. Blogging tips should be read more and more, this proves to be the most beneficial for them. It is very important to have the right information before doing any work. Apart from this, new bloggers need to learn the promotion of the blog as much as the blogging tips. Blog promotions should be tried on the most social media. Most readers meet with social media only. Keep sharing your posts on Facebook, Twitter, Google Plus and more. And through comments on other popular blogs, you can also promote your blog. You can comment on more and more blogs, and share a short link to your blog along with the comments, so that the readers who come to that blog will be able to reach your blog by going to your link. This will also give your blog a lot of readers. 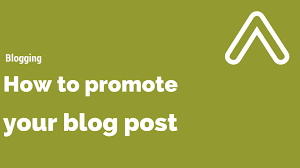 There are some wrong ways to use blog promotion in the blog world, from which readers do not like to come back to your blog. I also tell you about those methods. Also Read This:- Manual on Blogger Custom Domains: How to enable the HTTPS SSL? The first is the wrong way to steal the posts of others and post them in your name. Although this is a cyber crime, if a blog is registered and you have stolen his posts and posted it by your name then you may also have to give it, you can also get a cyber crime lawsuit. Apart from this, there is another negative aspect of this also that people have read a post earlier on any blog, and know that this post is from that blog, and now the same post will be seen on your blog if it is reversed. Will not come to your blog. That is because they get nothing new there, just get the posts of theft, so that by leaving the people, they leave the blog of the person who steals the posts to come to the blog. Even if he kills his hands, most people will not lift him. Second, if someone complains of copyright, then search engines will remove that copying blog from search. And if the ads from Google Adsense were engaged, they are also allowed. The second is the wrong way to force your posts to emails to others. This work is like dragging people onto your blog. It is okay to email only your specials and seekers, but some people keep sending their posts daily through email, without even knowing their identity, people are not read by them but they are troubled by them. Therefore it is wrong to send a link to your blog posts by forcefully sending someone an email. This does not attract people but they are far away from you. Use more and more social media for blog promotion, and submit your blog to search engines at the most, so that your blog is shown in the search engine results of maximum number. The best thing is that first of all, read the blog related tips and understand the bad aspects of it, so that you can run your blog in right earnest, and make better promotions. that's it for today.